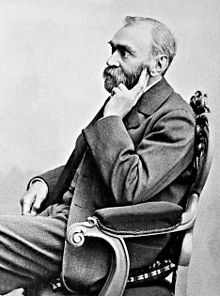 Swedish chemist, engineer, innovator, armaments manufacturer and the inventor of dynamite; owned Bofors, a major armaments manufacturer; in his last will, he used his enormous fortune to institute the Nobel Prizes. A Riddle, 1851, poem beginning "You say I am a riddle..."
1896-11-23, DK819C: Projektil med radielt paavirket Tätningsring. November 28, 1887, primary patent 181179 for blasting powder "ballistite" in France. 1877, a ten-year Russian patent "to produce new solid explosive substances from liquid explosives"
1895-04-18, GB189512384: Improvements in Gas Checks for Projectiles. 1896-04-11, GB189511346: Improvements in Forging Tubular Metallic Pieces. The Life of Alfred Nobel, 1929 by H Schock And R Sohlman. Nobel: The Man and his Prizes, 1950 by H Schock And R Sohlman.